April is the month of long weekends and with that comes opportunities for us to take a break from work and explore our cities and beyond. 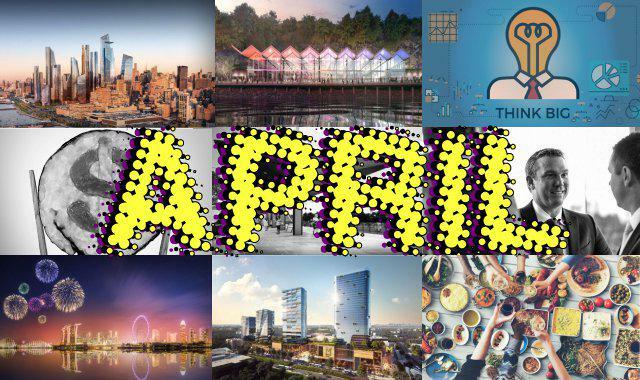 We know your time is your most important asset, so in our endeavours to inform, educate and inspire our audience, we thought we’d recap on the major themes and most engaged content in April 2017. Project features are an insightful way of gauging what solutions are being implemented around the world and how they better cities. Project outcomes both dictate and are dictated by greater trends and whilst they rarely individually define a city, as a collection projects make cities what they are. Precincts are the character within every city and the connectors between people and place. Great precincts are great neighbourhoods that give back to the city, as illustrated in the quote below by Jane Jacobs. “The more successfully a city mingles everyday diversity of uses and users in its everyday streets, the more successfully, casually (and economically) its people thereby enliven and support well-located parks that can thus give back grace and delight to their neighbourhoods instead of vacuity.” Jane JacobsBelow are the most clicked features on precincts. City features give an insightful look into the greater trends and the many opportunities and challenges that sit before us. No two cities in the world are the same and the more you explore them the more this becomes evident. Below are the most clicked features on cities. Infrastructure; How Do We Move Around Our Cities? Infrastructure is the equivalent of arteries in the human body. They are the dictators of movement and allow us to either flow freely through cities or impede our ability to do so. Infrastructure plays such a pivotal part in the DNA of our cities and we continue to see a much greater emphasis on getting it right. Below are the most clicked stories on infrastructure. One of the most beautiful aspects of cities is people; from those who make them to those who use them. It is people that define a cities identity, buildings and infrastructure are merely an extension of human power. Yet every city in the world faces the challenges of how to create inclusive communities that make for better ways of living. This month we have delved deeper into those using their positions as placemakers to give back. Below are the most clicked stories on people. Housing affordability is still the number one market factor fiercely debated in every Australian city. In May, The Urban Developer will be holding a national event series to delve further into this market issue and explore the potential opportunities for the development community. Below are the most clicked stories on markets. Through our day to day activities we get caught in the here and now of cities, yet occasionally it's good to stop, reflect and consider how we could do things differently. Below are the most clicked stories that will make you think differently about cities. Food; What Great Cities Don't Also Have Great Food? Just to clarify, we haven't turned into a food blog, instead we've taken a particular focus on retail experience. In May, The Urban Developer will be hosting a national event series taking you on an informative and delicious journey around the world’s most successful retail precincts and provide insight into what, when, why and how these precincts emerged.